A fundamental question in understanding neuronal computations is how dendritic events influence the neuron's output. Different forms of integration of neighboring and distributed synaptic inputs, isolated dendritic spikes and local regulation of synaptic efficacy suggest that individual dendritic branches may function as independent computational subunits. Specifically, long dendritic branches of hippocampal granule cells (Figure 1A) acting as independent subunits may be responsible for multiple place fields of these neurons (Figure 1C). We set up a cascade model (Figure 1B) to study the somato-dendritic interactions in neurons that is simple enough for analytical analysis but can be easily fitted to experimental data. We demonstrate that to trigger somatic firing by a single dendritic branch dendritic spiking and local plasticity are necessary. 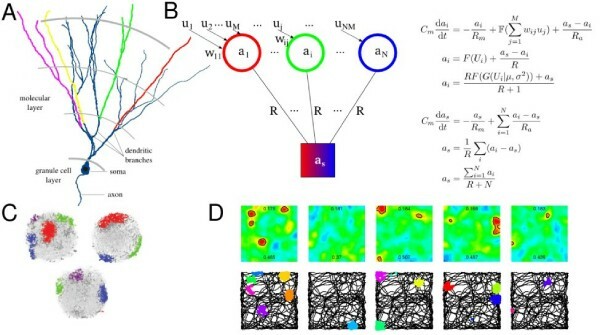 Moderately branched dendritic tree of granule cells is optimal for this computation as large number of branches favor local plasticity by isolating dendritic compartments, while reliable detection of individual dendritic spikes in the soma requires low branch number. Finally, using spatially organized input we demonstrate that these parallel dendritic computations explain the multiple independent place fields of granule cells (Figure 1D). Illustration of the structure and the operation of the model. A) The anatomical reconstruction of the dendritic tree of a granule cell from the dentate gyrus. B) Computational model for the somato-dendritic interactions in granule cells. C) Multiple place fields of granule cells recorded in vivo . D) The behavior of the model in three different environments. Upper row: ratemaps from the somatic activation. The contour indicates the firing threshold. Lower row: the locations of the dendritic spikes and the trajectory of the simulated animal. This work was supported by the EU Framework 6 ICEA project (IST 027819).